More than 70 percent of Americans consider themselves to be Christians. Of those, some surveys show up to 90 percent send their children to public schools. Does that affect the faith, worldview, and future church participation of these children? This article looks at the evolution of education in America—its original intent through its reformation into the modern public school system— as well as the outcome for Christian students and the important role that Christian education plays in the future of the church. As many well-meaning Christian parents send their children to public school believing that the curriculum is neutral, if the education system forbids even a mention of God, isn’t such secularism, as renowned Christian apologist Ravi Zacharias has said, just an illusion of neutrality? Still, many well-meaning Christian parents attend church on Sunday with their children who may attend Sunday school classes and participate in youth group and assume this will be enough. While church is of paramount importance in the life of a Christian, the statistics don’t play out and young people are leaving the church in droves as they enter their 20s. In the book Already Gone, the authors reveal research that indicates more than 60 percent of twenty-somethings who were churched as teens are now disengaged from the church. With so many Christians raising their children in public schools, is it possible that the public school in its “illusion of neutrality” has played a role in putting our children on a path that leads them away from faith and into relativism, where there are no absolutes which, ultimately, dismisses God? And, so, public schooling in America was underway. This was the foundation from which the founding generation of our nation was educated. 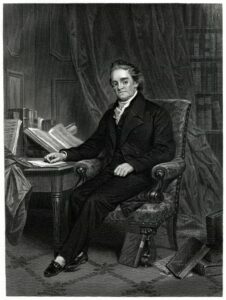 Chief among them would have been Noah Webster, author of the 1828 American Dictionary of the English Language and Founding Father of American scholarship. Webster first published A Grammatical Institute of the English Language, otherwise known as the Blue Back Speller, in 1783. His intent was to provide educational tools such as the Blue Back Spellerand his 1828 dictionary for children to provide a uniquely American, Christ-centered approach to teaching. The Blue Back Speller, which is rife with biblical references, became the staple for parents and educators for more than 100 years and helped to build the most literate nation in the history of the West. Further, The New England Primer was the first textbook ever printed in America and was used to teach reading and Bible lessons in schools until the 20th century. In fact, this too was so widespread in colonial America that many of the Founding Fathers and their children learned to read from The New England Primer. Noah Webster authored the Blue Back Speller, which was filled with biblical references and from which many Americans in the founding era learned to read. This Founders’ generation was educated in biblical principles as an intrinsic and expected element of their education. They reasoned from biblical principles and applied them to every area of life. Their biblical worldview informed their moral compass and permeated their thinking. Indeed, this thinking shaped our Founders, it shaped the ideas of liberty that made America unlike any other nation. It was, perhaps, inevitable that efforts to erode that biblical foundation would come. 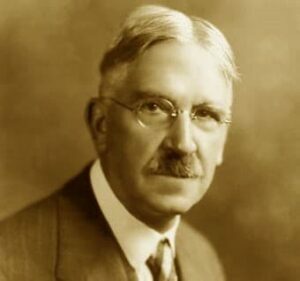 Many credit John Dewey as being the father of modern education in America and those who laud his reformative exertions hail Dewey as “a philosopher, social reformer, and educator who changed fundamental approaches to teaching and learning.” His work in education, however, is credited with ushering the Progressive Movement into schools in America. It is significant that a man who crafted education as it is today in America signed on to A Humanist Manifesto and was part of the American Humanist Association. The manifesto itself had just 34 signers and 15 brief points. John Dewey, a signer of A Humanist Manifesto, is credited as the architect of modern education in America. Other tenets of the manifesto to which Dewey signed his name include: “We are convinced that the time has passed for theism, deism, modernism, and the several varieties of ‘new thought.’” One final point of the manifesto states that “a socialized and cooperative economic order must be established to the end that the equitable distribution of the means of life be possible. The goal of humanism is a free and universal society in which people voluntarily and intelligently cooperate for the common good. Humanists demand a shared life in a shared world.” Never mind the apparent contradiction in that statement, what it implies is Socialism. Given Dewey’s declaration, it should be no small wonder then what Smithwick has found in his testing of Christian high school students around the country today. It seems this last point of A Humanist Manifesto is realizing fulfillment in public schools. 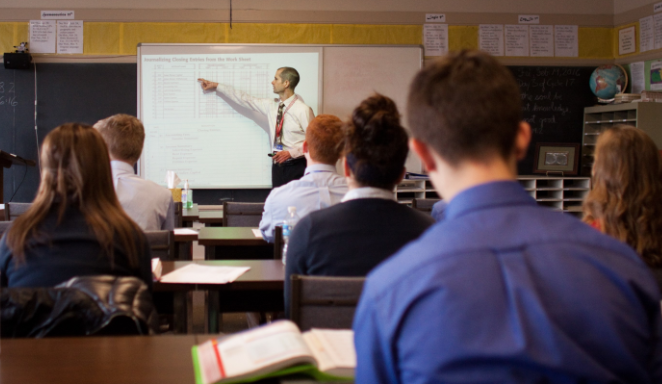 Smithwick’s Nehemiah Institute annually administers the PEERS test among high school students. It consists of a series of statements carefully structured to identify a person’s worldview in five categories: Politics, Economics, Education, Religion, and Social Issues (PEERS). Each statement is framed to either agree or disagree with a biblical principle. Students’ scores will place their worldview in four categories: Biblical Theism, Moderate Christian, Secular Humanism, or Socialism. In 2015, the test showed that 90 percent of students from Christian homes attending public schools score in a range that indicates that their views are firmly grounded in basic tenets of secularism. What is a Secular worldview according to the PEERS test? This chart from the Nehemiah Institute illustrates the results of its PEERS test, which reveals worldview for students from Christian homes in public schools, homeschools, traditional Christian schools, and biblical worldview schools like Dayspring. Nearly 90 percent of students in public schools who are from Christian homes test in the category of Secularism. Dewey had a worldview that he signed on to, and he used the public education system to disseminate it. Court case after court case has upheld the removal of God from schools. Prayer in school, the reading of the Bible in school, prayer at football games, and more have been banned from public schools. So, Christian students are in public schools. Do those seeds of secular humanism matter, if the children attend church on Sunday? It’s a good question. One must consider the amount of time spent sowing and watering or teaching and learning. By the time children graduate from high school, they will have spent 14,000 hours in school classrooms. If you spent 14,000 hours developing a skill, would you have mastered it? Would you be able to teach others the skill? The answer to both of these questions likely is yes. The same is true of worldview. A child will spend 14,000 hours in school where he or she will develop a worldview. While the child may be exposed to the principles of the Bible through home and church, a child will spend an average of just 1,325 hours over his school years in church if he or she regularly attends. Compare that with being educated in a secular setting for 14,000 hours over many years. What Is the Parents’ Role in Educating Their Children? It should, then, give pause to Christian families to hand over the education of their children to the State. An online article titled “Students Abandoning Faith: Why It Happens and What We Can Do” published by Summit Ministries, urges Christians to understand that “the battle is for the hearts and minds of students.” It goes on to say that it is essential to equip students with a biblical worldview to explain God’s truth in areas from philosophy to science, from economics to politics, and more. This not only enables them to understand how to think and reason from biblical principles and apply them to every area of life, it enables students to discern when college professors may present an anti-biblical bias and to explain that to their peers. Finally, the way children are educated does have lifelong effects. In 2011, a comprehensive study was done by Cardus, which calls itself a “think tank dedicated to the renewal of North American social architecture.” It surveyed graduates of public schools, Protestant Christian schools, Catholic schools, non-religious private schools, and homeschool settings. The results of the Cardus Education Survey shed light on these graduates and their habits later in life. Below is an outline drawn directly from the Executive Summary of the Cardus Education Survey. 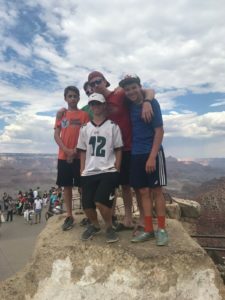 Outcome 1: Protestant Christian school graduates are uniquely compliant, generous, outwardly focused individuals who stabilize their communities by their uncommon commitment to their families, their churches, and larger society. Graduates of Christian schools donate money significantly more than graduates of other schools, despite having lower household income. Similarly, graduates of Protestant Christian schools are more generous with their time, participating far more than their peers both in service trips for relief and development and in mission trips for evangelization. Outcome 2: Protestant Christian schools, however, are more likely to make family the top-ranked emphasis than any of the other options given. This emphasis seems to be taking hold in Protestant Christian school graduates, who are having more children and divorcing less frequently than their peers from public and Catholic schools. what they have in life than their public school peers. In addition, Protestant Christian school graduates are the only private school graduates to report greater direction in life than their public school peers, with non-­religious private and Catholic school graduates feeling statistically the same as their public school peers. Outcome 4: Protestant Christian school graduates are more committed to their churches, practice spiritual disciplines more frequently, and are following church teachings at much greater rates than their Catholic, public, and non-­religious private school peers. Outcome 5: Christian schools have a very distinct impact on their graduates’ beliefs in religious and moral absolutes. While Protestant Christian school and homeschool graduates hold more strongly to the belief that morality is unchanging and absolute, the Catholic-school effect trends negative on this measure, but after controls is effectively the same as public school results. 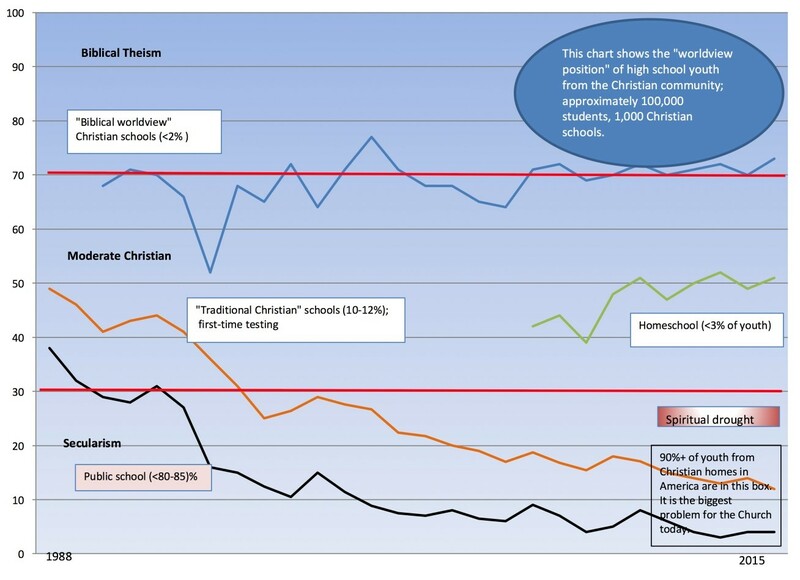 Outcome 6: On other measures, such as the belief that the Bible is infallible, Protestant Christian school and to a lesser degree homeschool graduates are distinct in their belief in the traditional teachings of the church, with Catholic and non-religious private schools’ graduates no different than public schoolers on this measure. Outcome 7: Protestant Christian school graduates are distinctively different from their peers in their belief that Jesus Christ is the only way to salvation. Protestant Christian school graduates are also far less likely to report having doubts about their faith. On every measure of traditional religious beliefs, Protestant Christian school graduates show significantly more adherence to the church teachings than their peers, findings that hold up after rigorous controls, indicating the impact of the Protestant Christian school on the long-term religious beliefs of their graduates. Outcome 8: Charity and financial support of the church are important values in both Catholic and Protestant churches; however, Protestant Christian school graduates are distinct in their giving habits, with Catholic school graduates practicing this discipline no more than their public school counterparts. Protestant Christian school graduates feel significantly more obliged to tithe, a behavior that translates into these graduates tithing three times more often than their public school counterparts. The graduates of Protestant Christian schools give significantly more money than all other school graduates. While some of these donations are congregational in nature. Protestant Christian school graduates are also giving significantly more to other religious causes despite having a lower household income. Outcome 9: One of the most significant findings in this study is the long-term commitment of Protestant Christian school graduates to stay within the Protestant faith. Attending a Protestant Christian school seems to impact graduates’ choice to stay into adulthood within the Christian faith. Other schooling types, including Catholic schools, have no impact on the religious affiliations their graduates choose as adults. Again, it is helpful to note that these findings are significant after controls for parent religion is added; this finding supports the notion that Protestant Christian schools should be considered an important part of the child­rearing equation. Outcome 10: Graduates of Protestant Christian schools also seem to be more committed to their churches, volunteering more and giving more money to their congregations. The graduates of Protestant Christian schools are also committing to mission trips in their adult lives significantly more than their peers in every other sector. These graduates are committing their time and their money to both evangelism and relief trips. Given this important information on education in America, it may be time for Christian parents to prayerfully consider the matter of education in the lives of their children. Looking at the roots of modern education in America, the removal of God from classrooms, and the outcomes associated with a Christian school education tell this story: the way we educate our children matters. This article originally appeared in Awaken Magazine (Volume 7. No. 1 Fall 2017), a publication of Dayspring Christian Academy. If you would like more information about Dayspring Christian Academy, please register for our Open House on March 15, 2018, at 6 p.m. using the button below. Alternatively, you can call Karol Hasting at 717-285-2000 with your questions or to set up a personal tour. 1Benjamin Rush, Essays, Literary, Moral and Philosophical (Philadelphia: Printed by Thomas and William Bradford, 1806) pp. 93-94. This article is reprinted with permission from Dayspring Christian Academy, Mountville, PA.